Type location Mozambique (Ponera laeviuscula n. 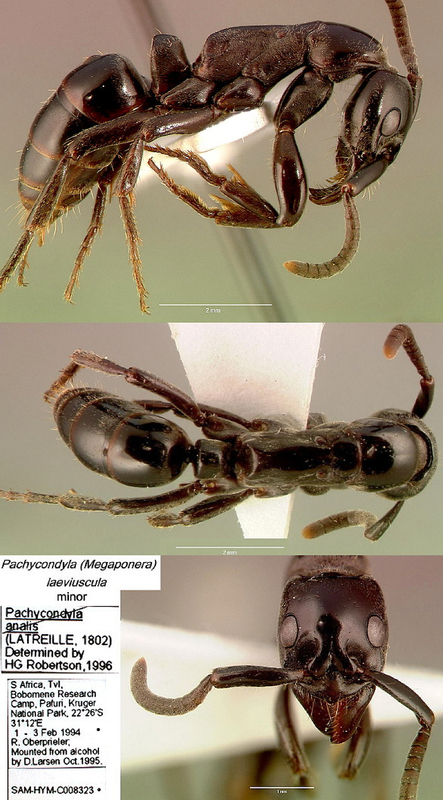 sp., Gerstäcker, 1859: 262, worker; not listed by Schmidt & Shattuck, 2014: 107) - no images on Antweb (June 2014). crassicornis (Ponera crassicornis n. sp., Gerstäcker, 1859: 262, worker; listed under analis by Schmidt & Shattuck, 2014: 107) from Mozambique - no images on Antweb (June 2014). Gerstäcker's (1859) descriptions of crassicornis and laeviuscula are at . Arnold (1915: 46) using the name foetens gave translations and notes; these are at and (sexual forms). Santschi's (1914b) description of rapax is at . Santschi (1930b) described termitivora but curiously revived crassicornis in a key at . Santschi (1937d) described subpilosa at . Boven (1967b) made a comparative study of the morphometrics of rapax, this is at . In his short description, Gerstaecker (1859) states the petiole is abbreviated and raised; also he refers to the grey pubescence. With the minor, crassicornis, he notes the mandibles, antennae and legs as rufo-piceous [in the minor of analis. these are almost uniformly dark red-brown]. 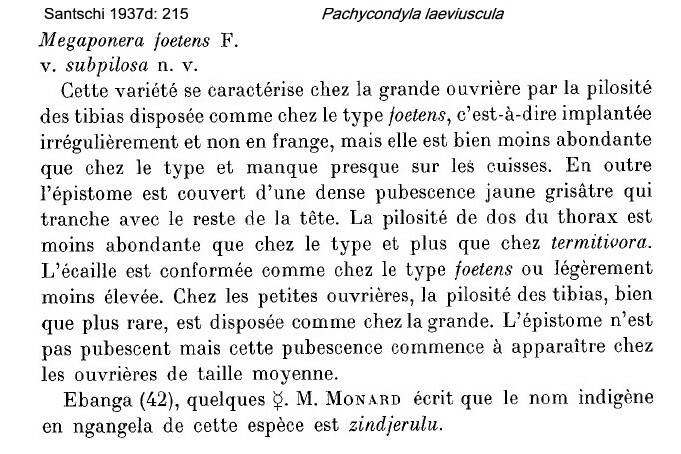 Forel (1909b: 64) related how it was Mayr (1907) who showed that Megaponera crassicornis Gerst. 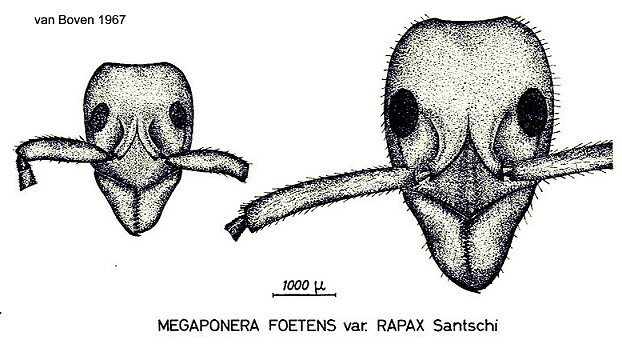 was not a species but was the worker minima of M. foetens. Similarly, Emery had given the name M. dohrni to a form intermediate between foetens and crassicornis but this was the intermediate or median form. Mr Creighton Wellman, collecting in Benguela, had found all the forms together. Creighton Wellman also had confirmed that the species moved in an Army Ant manner, with numerous individuals. Forel (1911d) noted Prell had observed the single file, army ant activity, mostly carrying dead workers or soldiers of termites, with the loud stridulation and strong odour of bitter almonds. Wheeler (1922) gave much detail on its termitophagic habits and how it migrated in columns, citing observations in East Africa. 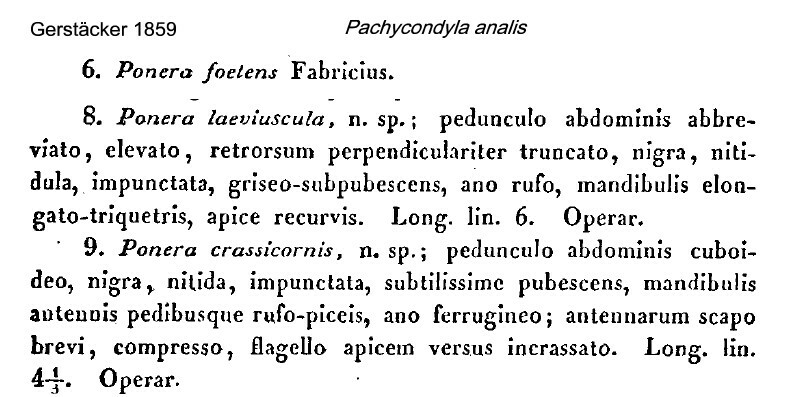 Compare with Pachycondyla analis. 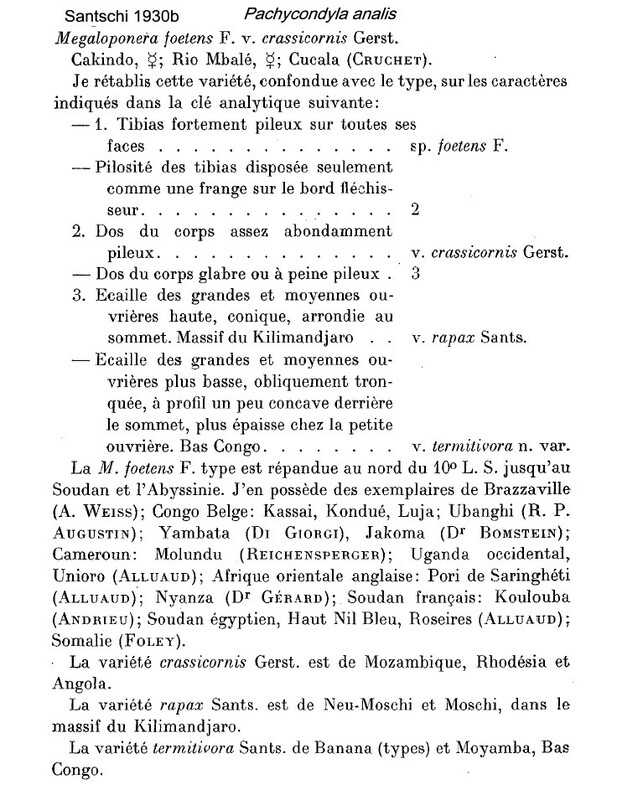 Boven (1967b) examined specimens of "Le variété rapax" from Angola and commented on the pilosity on tibiae and dorsal alitrunk. 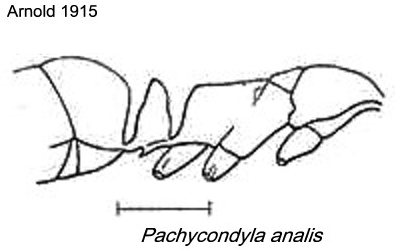 He also noted a longitudinal groove on the propodeum of major workers that was not found in the type P. foetens. His other descriptive notes, such as the shininess of the minor match the specimens shown below. It appears that he concluded the species shows true dimorphism. The recent (2005) BBC TV series "Life in the Undergrowth" part 4, included excellent footage on the attacks of "Matabele Ants" on termite mounds. The photomontage of the termitivora type worker is collated from http://www.antweb.org/specimen.do?name=rmca000017725. 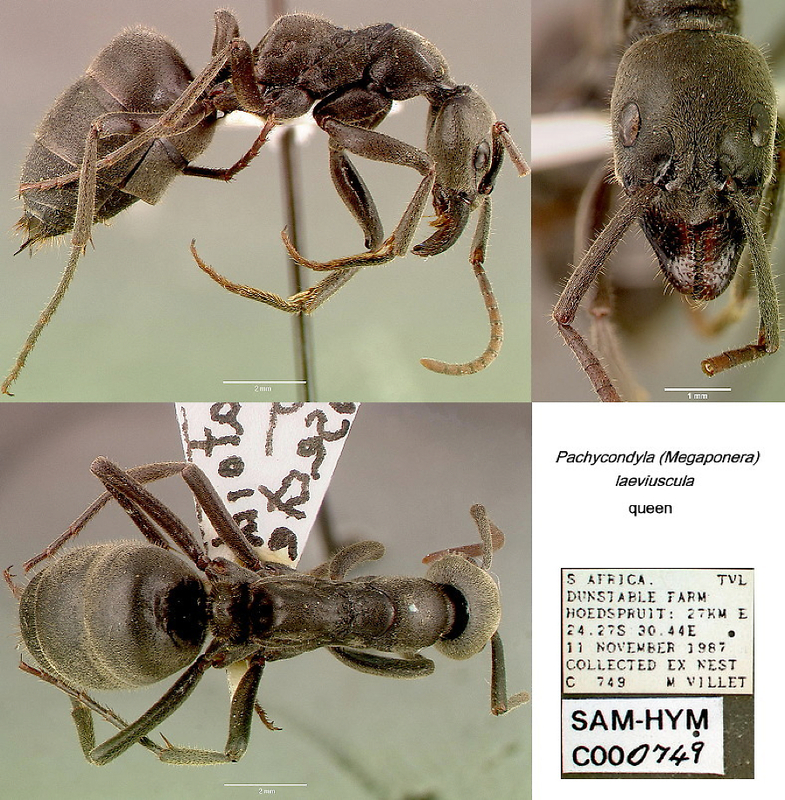 Collection Information: Specimen Code SAM-HYM-C000749B; Locality South Africa: Transvaal: Dunstable Farm, 27 km E of Hoedspruit; 24°27'00"S 030°44'00"E; Collection codes: SAM-HYM-C000749; Date: 11 Nov 1987; Collected by: M.H.Villet.